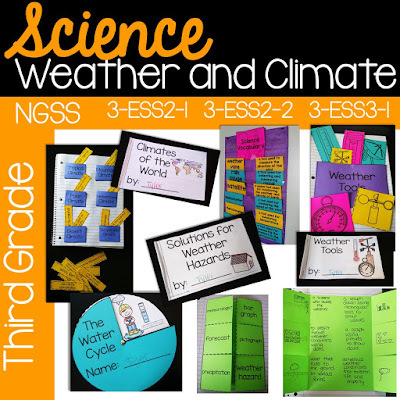 Scroll down to take a look at *some* of what is included in this 130 page third grade Weather & Climate unit. This unit aligns to NGSS* standards 3-ESS2-1, 3-ESS2-2, and 3-ESS3-1. Here is the table of contents. Click on the pictures to enlarge them. This topic focuses on identifying different types of weather, predicting, and graphing data. Students will also learn about various weather tools. Posters in each topic come in color and black and white. These support the main ideas of each topic. Photo posters to visually support learning. These are included for each topic as well. This topic focuses on learning about different types of solutions that are used to protect from weather hazards. This topic focuses on six different climates: Mediterranean, Polar, Desert, Tropical, Temperate, and Mountains. There are passages (with comprehension questions) throughout the unit. For a description of the eight passages included, please see the table of contents. This was just a preview. For a FULL list of resources included in this 130 page Weather and Climate unit, please see the Table of Contents or check out the 36 page preview by following the link to my TPT store. *NGSS and Next Generation Science Standards are a registered trademark of Achieve. Neither Achieve nor the lead states and partners that developed the Next Generation Science Standards was involved in the production of, and does not endorse, this product. This looks great, but I am nervous about spending so much on a resource with seeing its entirety. Just purchased it. Looking forward to using it! How long will this unit take? Can I get it in in 3 weeks? Absolutely! It doesn't require a specific amount of time.